I hear something that sounds like a leaf blower. Other than that, it is relatively quiet. Birds, breeze, barking. Shabbot. A day of rest that I more easily manage in Israel because there are no classes to take and shops and restaurants are more likely to be closed. Also, the thrilling wear and tear of a week in a bustling city forces me to actually rest. Rather than the convenience of my car, which I suspect would not be so convenient here in Tel Aviv, my mode of transit consists of my own two feet or my own two feet meeting the slightly unsteady pedals on my highly prized, used, aluminum jalopee. By foot my thoughts wander more freely. By bike my awareness is heightened; it is ultra sensitive, like in a game of dodgeball. While there are designated bike lanes on the beautiful boulevards and along the boardwalk that lines the beach these lanes also tend to be shared with strolling pedestrians. Riding becomes a game of dodging and darting or haulting and yielding. I am learning to slip through narrow, fleshy passage ways. Or I swerve around tree trunks and stumbling toddlers. In the market I consciously attend to allowing the barrage of people, sounds, and smells to stun my senses and then pass through me, the way we practiced being a sieve or a mesananet in Gaga class. Doing this makes me feel more like a filter and less of a container–permeable boundaries. I am in my sixth week of the inaugural Gaga teacher training program in Tel Aviv, Israel. I have also begun the Feldenkrais-based, Ilan Lev Method training course. Time passes quickly. It feels more difficult to measure the passage of time because although the weather is slightly chilly in the afternoon and evenings it remains generally sunny, breezy, and beachy. No turning of leaves or threats of snow. Occasional rain clouds and sprinkles. In one of our classes with Ohad Fishof we discussed the elements of music and the dynamic range found within a single note. I really enjoyed the idea of the triad relationship between the source of sound, the listener and the environment; they are relational and exist independently. We played with finding a groove in a song while moving, then maintaining that groove in our bodies while moving to a new song with a different rhythm. When we were invited to release our voices in varying timbres of “ahhhhhhh” I was reminded of the vulnerability and power I sense in releasing the voice with a group of people; it was as if our more commonly known selves evaporated into our sounds that permeated through space from the vibrations escaping our bodies. Contradictory tasks abound in my experience of Gaga. Dropping my shoulder blades while lifting my rib cage, grabbing my flesh around my bones while releasing into my flesh in order to grow wider and more expansive, pulling my tailbone forward while feeling the curve of the front of my spine arching backwards. These are movement puzzles or sensory tongue twisters without concrete answers. The answers exist in the seeking and discovering or what the teachers refer to as “research.” The more time I spend in practice the more I discover about new possibilities in movement. With these discoveries, I find that I have so much more to learn about how much more I can do with my body or how I can further physically embody the sensory tasks we are given. If I ever thought I was making tiny collapses in my rib cage, I was not. If I thought that I melted the flesh in my chest while floating, I did not. Or not enough. We are instructed to imitate the teachers. In repertory we were told to “Be Yaniv” in reference to producing the movement qualities and forms that exist in the choreography. We are invited to use the most basic way to learn, to copy. I appreciated that Yaniv described this kind of imitation as a form of intelligence. I celebrate any occasion to honor sensory/ bodily/physical/intuitive intelligence. It is like finding oneself backwards. Try on something else and eventually more of oneself emerges through the form. In Gaga classes I am always taking inspiration from the instructor or other students in the class. I can see the total body integration of the verbal prompts in the physical expressions of our teachers. Often, it is more direct if I try to embody or “copy” what they are doing. Since we are now looking through the lens of how to teach Gaga, I am noticing individual teaching styles through the use of volume and tone of voice and the class’s progression. I take note of how I take a class or how I feel inside of each teachers class. In Doron’s class my feet feel very juicy, which gradually spreads to the rest of my body, in Aya’s class I ride on her enthusiasm and find nuance while attending to many tasks at once, by the end of Idan’s class my flesh feels like it has been rung out like a towel, in Ohad Naharin’s class I try not to let myself be overwhelmed by intimidation and I feel the expansiveness of my body while I simultaneously listen to internal messages and external information and so on and so forth with many other teachers. Most classes start rather quietly. Listening. Finding gentle movement in the body or scanning the body, spreading the soles of the feet on the floor, listening for information from the floor and letting that information travel throughout the body. Always, we are floating. It is the default mode. We are always reminded not to become introverted while we are moving. I like the practice of seeing how my peers respond to information and “trying on” alternate ways of moving or watching how people listen to the body. Since we are twenty-seven from Israel, Europe, Mexico, South America, Russia, Japan, South Korea and the States, there is quite a variety in background and experience. I love the possibility of knowing one another through this new language. 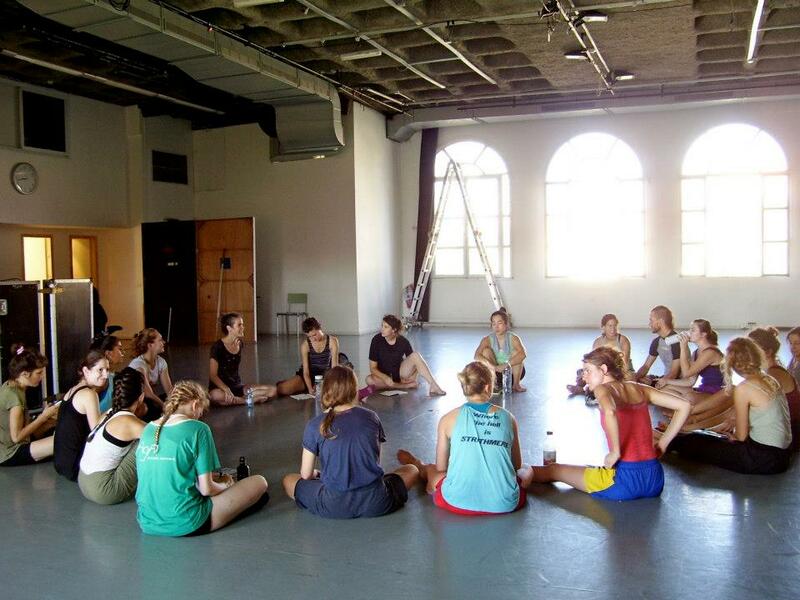 In a toolbox session with Ohad Naharin we watched each other in groups. We played with varying levels of focus: tuning in to one person while keeping the entire group in frame, fuzzily; seeing the entire group impressionistically; noticing the physical “noise” level of the group. He urged us to see “out of focus” so that we could see more things at once. Focusing too much on one detail made it too easy to lose sight of the rest of the group or event or situation. I think this idea is true as a teacher of Gaga, choreographer, performer and in the everyday. It is a good question to continue to ask myself and to be able to practice in this setting–how to zoom in and not lose sight of the big picture–a nice reminder of a well-known idea. It is refreshing to have no syllabus, no textbook, no articles or essays. It is more of an oral/physical transmission of information that so effectively honors the bodily intelligence that Yaniv mentioned. Everything is in the moment. In most of our classes teachers ask us “Why hold back?” Bosmot says, “Why not bigger?” Or “What are we saving anything for?” Schedules and class content shifts on an as needed basis. If a roadblock arises, we move on to something or somewhere else. In the Ilan Lev training, the founder talks about being lazy or avoiding effort, finding pulses or drawing energy from the ground. He insists that we/our bodies know the information he is helping us to realize the same way that a bird knows how to fly. In part, he says it is a matter of listening. I also think it is a matter of trusting oneself. There are few things that are more difficult for me than to give into effortlessness and sometimes the trust this requires. My upbringing and education has been primarily centered around working hard or making things happen, rigorous perserverence and ‘healthy’ skepticism. In both Gaga and Ilan Lev I am practicing decision-making and allowing things to happen. Spaces that value this kind of practice are rare. Being in a foreign country and navigating its more familiar, yet still unfamiliar codes also requires me to use this balance of listening, allowing and deciding. Then, I can be inspired by the work of emerging choreographers. In this series, Curtain Up, I saw several works that made me wonder “how did they do that?” In most of the pieces I read a ‘Gagic’ influence in the way the performers moved through many qualities that made their bodies appear like they were moving through thick substances or that they were melting into the floor or piercing space with their bones. They had a liquid or gumby boniness when flexing or giving into the joints; it was like the front of their ankles could touch the top of their feet. They were very “efficient” (a term our instructors use all the time) when transitioning from one thing to another–there was no ambiguity or extra anything. Seamless, yet specific, with “changing stories” (another term we are asked to practice) or shifting between seemingly contradictory states, qualities, levels. I always enjoy seeing the way someone I know appears in the movement vocabulary or choreographic elements in his/her work. Our instructor Doron set a duet titled Valentia. When the curtain revealed a lone woman facing the audience, pink flowers on her form-fitted flesh-colored costume, hair swept slickly back, through her posturing, I thought she was Doron, but she was very clearly not Doron. She stood still for the duration of nearly an entire song and suddenly collapsed her torso and pelvis to the ground between her feet. I thought how much that would hurt if I attempted the same movement. I am pretty sure I would break my knees or pull several muscles and tendons. It was so precise and had the energy of heavy fall, like a television falling from a balcony or a torpedo aiming straight down, but was cushioned by the elastic quality in her hips, knees and ankles and the reverberation in her torso, neck and head when she landed. And she did not flinch or lose her penetrating gaze toward the audience. Eventually, she was joined by a similarly dressed counterpart, like mirror twins. Immediately I noticed how their feet seemed to collect information from the floor the way that I perceive Doron’s to do. There was a gummy quality in the movement and a silky force that came through the fists punching down toward the floor, like pushing through wet cement. The trio, Speaker, created a Barbarellan, futuristic, Star Trekkish, unnameable world. I felt transported to another planet or realm. Much like the other work I have seen by Noa, the movement was sharp, exact and unwavering. There is something about the way that she asserts movement in space or arranges performers in the space in conjunction with Ohad’s otherworldly electronic scores that makes me feel fleshy, highly attuned creatures in a particular environment. The movement is constantly shifting qualities and levels. In the unfolding events, I experience the freedom of whimsy and the intention of something that could not happen any other way. There was a series of unexpected stop and go, animal sounds and sighs and idiosyncratic postures and jumps that resembled something between creature-human-being. It looked like they were landing on dimes, effortlessly. Finding movement from no where, jumping without preparation. It was like hanging on a person’s every word, but hanging on their every movement. In Osnat Kelner’s piece The sad little, unappreciative, Pisces Jesus man I felt I was at the best rock concert of my life. I wanted to stand up and thrash. It was such a satisfying integration of live music and dance. The members of the band were the dancers and the dancers were the band. Our teacher Idan performed as a drummer/dancer. He said he learned to drum specifically for this work. At the beginning, three performers were huddled together at the front of the stage in dim hues and a lone man stood at the keyboard upstage left in a pool of light. Gradually, guitar, bass, mics and a drumset were introduced to match the rock-n-roll/headbanger costumery sporting net tops, plaid kilts, armless t-shirts, feathered jackets and jeans and black leather lace up boots. Four men were running, diving, lifting, catching, throwing and singing, strumming and drumming. It was an endless space of rearranging. Nothing stood still. The air felt smoky. I can remember very few isolated details, only that I was completely invested or a part of their explosive world. The text at the closing was touching “it is better to burn out than to fade away…” and throughout the piece there was a looming tenderness between the performers. Their bond seemed evident. In a very different way, Six Years Later by Roy Assaf captivated me. A tango-esque, possibly Contact Improvisation-inspired, ninja-ish duet continuously delighted me. Similarly, I felt their connection was visible. Catching and sensing and legs twining and untwining while they maneuvered with each other through space. It was tenderly sensory; nearly romantic. Maybe it was a matter of how they listened to each other and paid attention to the space between and around them. For all of these pieces I wished I could have been a fly on the wall throughout the process. I decided to post some of my reflections and emails from my travels in Israel and my experience of the Gaga Intensive. Photos from my trip are posted on Facebook, as well as a video of our final showing of Minus 16. I felt apprehensive in posting all of this, but decided to go ahead and share it. It is incredible how new and fresh everything appears and feels upon returning from my trip. This happens when I return from most trips, even if it is a day outside of the city where I happen to be living. In Ohio right now, the trees are lush, full, and green. Crickets and birds are chirping in the morning. The dew in the grass and the cool moisture in the air in the mornings remind me of sneaking out of the house when I had sleepovers when I was a teenager. Rain clouds threaten us. Jetlag is allowing me to rise before the sun. In Toledo, I have walked to a grassy field to try to watch it rise, but the trees block my view. This morning, I did Abby’s Chi Gong series with my feet in the dewy grasses as the sun was rising behind the trees. As soon as I stepped off the plane in Philadelphia, I could feel my body begin to seize, trying to shut down bit by bit to avoid the overwhelming stimulation of the environment. In the morning it was decently quiet, but there was still a different feel/vibe/energy (does anyone have a better word for this?) in the air. Gradually, the airport filled with travelers, workers, coffee shops, restaurants, stores opened, the woman behind the register at Dunkin Donuts (my guilty pleasure) yelling, “Next!” The transport cars started beeping at the crowds, people started scurrying, voices on cell phones, people glued to lap top screens, suitcase wheels traversing the floors, hard soled shoes clanking on the linoleum the frigid blast of the air conditioning. It did not matter that I had just returned from a magical trip across the ocean and had spent a month in some kind of sensuous and enlivening capsule of an experience. My mind/body wanted to shut down, close off, tune out, clamp onto the many transformations I had just experienced. It started with the skin trying to protect itself, then layer by layer going inward I could feel hardening and closing. Instead of continuing with these sensations, I connected to a sense of pleasure. I tried to find a deep sensitivity in my skin, my flesh, my insides. My eyes softened to try and meet what I was seeing-not to overextend or shut off, but to receive the information while I continued to maintain my own perceptions and experience. Instead of the sounds becoming garbled or tuning them out to a muffle I tried to distinguish the sounds, hear them one at a time and then together. It was exhausting, but felt so alive. If I could endure and even come to enjoy the extreme heat and humidity of Tel Aviv for an entire month, I could find a way to embrace the chill in the airport for a few hours. When our flight landed I noticed that my back was protesting the hours of sitting in a chair with no lumbar support. After I got off the plane I imagined honey and white light passing through my body, along my spine, massaging my spine and pelvis. I realize this might sound ridiculous, but it really helped. This entire month of experiencing Gaga has really shed light on the power of the mind in a very practical and tangible way. It has made me reflect on what do I spend my time thinking about, worrying about, wanting, despising? How do I think about life and the world and what is that doing to my mental and physical experience-essentially, my life? Gaga is a very rich movement resource as a dancer, for a dancer, but I think even more so, this unique language has spoken to me as a human being trying to make sense of the world or to cope with the circumstances that are often beyond my control. Then, even if circumstances are beyond my control, how do I control my response, maintain my experience. I found this method of training to be confrontational, yet compassionate, aggressive, yet vulnerable, extra-sensory, expansive, surprising, silly, serious, extreme, open, curious, and inviting. I appreciated the endless invitations to try new ideas, to really move beyond what is familiar. Of course, these invitations occurred in the dance studio within the context of a class setting, within the laboratory of our own bodies, but I found/find it translating to nearly everything that I have done/am doing. The idea and practice of the simultaneity of opposing forces existing together really spoke to me. Instead of either/or, I felt more of both/and value systems present. I know I must sound like I have submitted everything to this practice, but quite the contrary, I view it as a layer to put over, under, around or within my dance related activities and daily life. Like the many somatic practices that have helped me to uncover, reveal, or expose new worlds of information, Gaga offers another channel. The constant motion and integration of verbal instruction, imagery, and embodied practice are welcome for a kinesthetic learner. To me, it is more like poetry than narrative. It is sort of in between or around, the essence, a hint. I like to live and understand through this in between place, which I feel is so often undervalued. The most meaningful things I have experienced are often indescribable through words. Often, words can only skim the surface and it is a celebratory occasion when words are used well enough that they can create the feeling of the unnamable. Although words guide the practitioner of Gaga to an experience in the body, the body has to find it despite the words. This is another issue with which I have been struggling internally. My aversion to using words to understand or describe this practice or any dance/movement-based experience (is it not the point of dance that we are NOT speaking, writing, talking? ), yet, the first thing I would do after a Gaga class is run to my notebook to start scribbling furiously. I sent detailed emails about my experience of the intensive and encounters in Israel. What does the word do that dance does not accomplish alone? Part of my aversion is that the minute I write something down I feel as though it is being taken away from me, or that I have forgotten it, or have been given permission to forget it. However, I cannot stop myself, it feels compulsory to write things down. Another interesting note was finding that even though I was communicating through email, Facebook, and Skype, I still felt the desire to send postcards. What is special about writing with a pen on paper, rather than typing on computer keys? I wish I felt more compulsive about completing my research paper. This makes me wonder about my own personality and what specific structures, confines, or boundaries do to my writing, dancing, life—how it sort of drains the joy I can find in writing right out of it—so what is the value in writing in this format? I know there IS value. Which leads me to articulation. I think I strive to articulate what has happened, more than articulating, I want to share, but sharing requires articulation, because not everyone can appreciate or understand my stream of consciousness babble. Maybe on some subconscious level, this has something to do with wanting to be able to communicate with a broader spectrum of people. I do not think my experience would have been as rich if I had not been walking the streets of Tel Aviv everyday, to and from the Lishay and Kfir’s apartment to the Suzanne Dellal Center (a 30 minute walk, 15 if you are a speed walker like Lishay). I walked down Hamelekh George lined with many inexpensive dress shops, falafel stands, yogurt stands, bakeries-it is busy, buses pass, cars, people, past Dizengoff and the huge 5 story mall, past HaMaccabi and a little market area, past the Shuk Ha Carmel chaos, past Grutzenberg the residential street, and finally arriving at the landmark of the building under construction which became the benchmark for entering Neve Tsedek, the neighborhood where Suzanne Dellal Center lived. It was a quaint and lovely walk from the start of Shabazi Street. I would pass expensive boutiques selling jewelry and dresses, as well as coffee shops that reminded me of what I think European cafes might be like, wine bars, slightly trendy, yet relaxed restaurants, cobblestone. When I first arrived, I had the sense that I was in much more of a hurry than everyone else, the reason I thought this was because I was passing everyone on the sidewalks. By the end, at times I felt I was able to relax in my walking pace, or at least connect to a sense of plenty of time inside while still moving quickly. While I recognize people in Israel have their own set of stresses and pressures, I really felt I was able to relax in a different way in this environment, because the people around me were relaxed in a specific way. This falls into an unnamable category, more of a sense. I would have to say it was the Gaga in conjunction with living in this environment that allowed my body to release, to not have a nagging sense that there was something else I also needed to be doing, to help cease the schedule that likes to turn over and over in my mind, that would allow me to just sit on a beach for as long as I wanted. The sea did something to me. It was so delicious to be able to sit on the beach and look at the water going on and on, a sense of infinity, unlike what I experience in the bushy trees of the Midwest. The sounds of the waves crashing, the sun pounding down or becoming cooler and softer as it sunk into the horizon. Really, I have been to many beaches before, but I do not know that I ever drank it in so dramatically in the past. I had more coffees and conversations with strangers I would meet in everyday settings than I tend to allow myself while in the States. I realize this could be a number of factors: traveling provides a different mentality, time, work, school-our daily lives do not always seem to allow us these brief and lovely encounters. Then I started to think that really it is me that does not allow myself to experience these brief and lovely encounters wherever I might be. Since I have been back, I have noticed myself taking more time to talk to the cashier at the grocery store, the barista at the coffee shop. I hope that I can hold on to this—this kind of openness and sense of time, the sense that I have the time and even if I do not have the time I can make the time. What is so important that I cannot engage with other people? I found people to be very openly sensual or affectionate in public. Maybe it was the food, the extreme temperature and humidity, the sea being 10 minutes from anywhere in the city, the underlying conflicts and histories-I do not know what or why, but I really appreciated the kisses on the cheeks and hugs when greeting and affection of couples in the streets. Sometimes, I found verbal communication to be quite direct, and I also came to appreciate this level of honesty. It made me wonder how many layers we can keep between ourselves and another by not saying something or constantly altering what we might want to say. On one level I think that this forced me to step up my assertiveness, on another, I think during the Gaga classes I felt invited to view my soft spokenness and lack of desire to be “an entertainer” as a facilitator as perfectly fine. The teachers for Gaga never raised their voices. Sometimes it was difficult to hear, but I felt this was in accordance with the fact that this movement exploration was not about putting something on or putting on airs. I felt safer walking alone in the streets in Tel Aviv at 3 in the morning than I do sometimes walking alone in Columbus in broad daylight. This is interesting. While I was there, I thought about what we see through the limited lens of the media and what is actually happening. I have been thinking about the way we categorize, label, or try to name things so that we can think we understand a person, place, or thing. I am not devaluing this human tendency, only questioning the automatic nature of it or seeing the limitations within this mode of understanding. This is something I also thought about Gaga. It seems its very nature values demechanization and heterogeneity, which I can stand behind. What I am finding is that Gaga helps me to realize what I already feel to be true and may have known intellectually and at times through my actions. Now, I feel I have more tools to assist in applying these elements into my lifestyle. Our first class was a 1.5 hour Gaga class. A former company member enthusiastically taught the class. We did a bit of playing with the sensation of imaging that we are floating in water, experimenting with gravity, finding sensation in all of our body parts, knowing the difference between a shake and a quake in gaga terminology (quake is supposed to be internally initiated from somewhere inside the body and shake is like trying to flick something off of the body). She referenced the moons (joints/balls at end of fingers and toes), and making the body available. Constant movement, shifting, awareness, finding freedom in form, allowing yourself to feel as though there is plenty of time, even when moving quickly–the class is constantly moving for 1.5 hours. We were in a studio on the third floor of the building, with a view overlooking the Mediterranean. Hot was an understatement in regard to temperature–I felt like melting chocoloate. I was cracking up that she actually had us do the smacking exercise with a partner, we were all completely drenched with sweat and had to smack our partners bodies with our hands–very hard, sweat was flying everywhere. My introduction to this poor girl fromEurope was her smacking my nasty sweaty back and then me smacking hers. The idea was to try to connect to a sense of pleasure even when experiencing discomfort. Later in the day, Ohad referred to it as finding “happy flesh.” Just as I was thinking I could take no more of the extreme heat she had us imagine that we were standing in a cold shower with water dripping all over us, slow drips, faster, etc. Next, Yaarah and Tom taught us some repertory from the piece, Max. We learned a section called Yaz. I did not necessarily embody it exactly as they did, but I loved the quirkiness, the mix of sudden, soft, aggressive, sudden, and delicate. It was quite challenging, but the gestures were so intricate, explosive, and powerful. Watching the company members move is pretty stunning. Again, the heat. Finally, we had a Gaga Methodics class, which was to help break down the Gaga principles, which Ohad taught. I did not realize this meant we would be dancing again. I thought, pen and paper, some notes. However, it was more of an in depth Gaga class and puddles of sweat. Not that I’m complaining, it was amazing. I find the imagery and reference to anatomy and daily activites so rich It is sort of magical and “groovy,” he told us to loosen up and “get groovy.” I really liked an exercise he did with the head and spine. Imagining as though we were falling into water with our spine. I was trying to imagine what it must look like for an outsider to walk in and see a room full of people writhing and contorting and squirming and trying to move from every which way. It appears as though a spell has been cast upon the room. For me, this experience is about extremes. Extreme heat, pushing beyond our mental and physical boundaries to find extremes within the body. We have been fortunate to have a number of different instructors, Ohad and company members. It is so rich to try and understand this “language” through varied lenses. Also with the rep, it is inspiring to really see and experience the honoring of the individual approaches to movement and interpretations or expressions of details, yet having attention to creating unison. We have learned excerpts from Max, which is so fast, so intense, one of the solos we learned I had to just move out of the way for fear of being stampeded or breaking my leg. We also learned part of Kamuyot, which brings me tears doing it and watching it. The music and subtleties and unison is SO inexplicably beautiful, yet the piece is not about anything particularly emotional, it is about the performers being in the center of the audience, so people are all around the dancers and also about really seeing. Daniel kept saying, “do not add your emotions, this is not an emotional indulgence.” It was so incredible to be moved by something that is not necessarily driven by emotion. In the Gaga classes, I find so many wonderful metaphors for ways to approach life, as well as how to find new places, spaces, information in the body. They are like modern day mantras for daily life. In all the exercises they say to connect to a feeling that there is “plenty of time,” even if you are moving quickly. Yesterday, we spent time trying to find sensation in our face and head in the same way we would find sensation in our hands. I have found in the last few days the “stiffest” part of my body is not my hips or back as I would suspect, but my face. It is so difficult to bring deep sensation to my face, which was a surprise. We also talked about the pinky finger being forgotten, the “moon” under the second toe, he also talks about the groin area. We did an incredibly difficult exercise where we had to “fold” or tighten an area of our body while allowing other body parts to “float” or be more fluid/soft. My shoulders were about to burst because we spent so much time trying to pull them away from each other, yet feel their connection (sort of like electric space with a partner, but we were working our shoulder blades like mad. I don’t think I have a toxin left in my body with all this sweating. Being near the sea is amazing. We can go to the beach after class and float. Last Friday, Ohad Naharin announced that he wanted to add an extra hour of activity at the end of our days for the second week. We were instructed to sign up (if we so desired), 25 people at a time, to improvise. It has been so interesting to observe the choices people make, how this experience may have influenced movement choices. The Gaga People classes are so incredible, people of all ages, I would say ages 18-70 crowd into the studio for this movement experience. I perceive people to be so open, so alive, and so connected to their personal movement experience, as well as the room full of people. It is joyous to watch people move and to move with them. The other day we did an exercise where we had to lightly touch our necks with the tips of our fingers, barely touching, to create a very sensitive, gentle sensation. Then we were invited to bring this sensitivity into the rest of our body, finally the teacher said put this sensation in your eyes and see how it feels to see the room, the other people, the world with this kind of sensitivity. Looking around, there was such softness and openness in everyone’s eyes. It was so powerful, vulnerable, and lovely. It is my final day in Israel. I can not believe a month has already passed. I took my final Gaga classes on Thursday evening (I took 3 classes that day to try and absorb all that I could before leaving). The teacher of my final class played a lot of disco music, it was great (for some reason I am a fan of disco). This is another thing I love about Gaga, the music can be anything, it is not necessarily set to specific exercises as it typically is in dance technique classes. Some teachers just hit shuffle on their iPods, others create playlists, some use CD’s, but songs are not typically set to particular exercises, yet it is very much a part of what we are doing. Usually at some point in the class we are invited to find the “groove,” not the beat, but the groove of the music in combination with the “groove” we find in our bodies. The teachers are also amazing because during the Gaga People classes they instruct in Hebrew and English. I started to pick up on some words–for example biefneem. Several words would surround this word, but I was picking up on this particular word, which means “inside.” Later I would learn they were saying “decorate the inside of yourself,” “find things traveling inside,” “put a smile inside of you.” Sometimes we had circles moving different parts of our bodies or we were moving around circles surrounding us. When I talk to people about Gaga, it is as though they/I have been “turned on” by it, found new worlds of information, ways of moving, feeling, thinking about moving, experiencing movement, observing movement. I have heard the the classes and workshops that have been offered in NY are packed, the intensive was packed. Maybe it has come along at the right place at the right time. -Connect to a sense of pleasure. -Connect to a sense of plenty of time. -Imagine a box in your torso, move it around, crush it. -Decorate your foot when you point it. -See your internal and outer world with your eyes open. -Find a feeling of expansiveness. -Taste something delicious on your tongue, put this taste inside your whole body. -Bring attention to the space between your armpit and the torso, between the legs, behind the ears. -Stretch the area between your groin and belly button. -Stretch all your body parts away from your sits bones. -Be like an animal, in the present. -Imagine tiger eyes all over your body, see everything everywhere all the time. -Always be at the beginning, don’t concern yourself with ending, when you arrive, arrive at a new beginning. -Allow your body to fall into movement. -Imagine your body is floating in water. -Imagine there is a tunnel from your foot through your ankle. -Imagine your flesh grabbing your bones. -Imagine your bones trying to escape the flesh. -Allow your organs to fall into the floor. -Allow your feet and hands to receive the floor. -Imagine you are hit with an explosion that is trying to escape from inside of you. -Imagine there is a ball inside of you moving from limb to limb. -Imagine your blood is like lava flowing through the body. -Imagine honey traveling through your body. Allow honey to drop on your chest. -Find a pulse or internal energy or groove that can connect to the music. -Delicately sense the skin on the back and front of hands, put this sensitivity into the entire body. -Bring awareness to the face, back of neck, armpit, joint under the second toe, bring sensitivity and sensation to these areas. -Fold or collapse one area while opening another area. -Melt the flesh in the ribs and chest, but still reach out. -When you turn your head, feel it in your tail bone. -Be the movement, the image, the sensation. -Imagine circles in your elbows, knees, and feet. Isolate the circles in different areas, then put multiple circles everywhere in the body. Break the flow of the circle, don’t complete it. With a partner: connect to the energy from your partner’s circles, but still maintain your own energy and circles. -Experiment with pulling energy in from other people/the room, then keep your energy to yourself, see how this feels different. -Imagine a rope connecting your arms and a snake in your spine. -Imagine there is a tripod in the bottom of your foot connecting two points in the ball and one in the heel. -When doing a grande plie, imagine you could change directions at any moment. -Point your big toe, stop pointing the big toe, hold the memory of pointing your big toe. -Bring awareness, energy, traveling stuff to the edges of yourself. -Allow your movement to get bigger to go faster. -Find a “wow” and put it inside of you. The first morning in Tel Aviv I awoke to the neighbor playing “Shine on you Crazy Diamonds” in the courtyard. When I peered out the window, I couldn’t see anyone, because the other buildings are blocked by luscious, pink flowering trees, but I did catch a bit of an audio sing along. I will probably regret saying this, but it is not as hot as I thought it would be. I don’t even need the A/C. Lishay and his roommate Kfir cleared their porch so I could have my own room. It is so cozy and I get a great view of the greenery. They put potted flowers in my windows. Our bags get checked when going into malls and large public buildings/events. Lishay said when he first arrived in the States and went shopping, he forgot he did not have to do this and opened his bags to show the retail clerk his possessions. I feel so inadequate not being able to speak in Hebrew or Arabic. Yet, splashes of America and English are nearly everywhere. There’s an American Apparrel across the street. They sell the brand of yogurt I have been eating in the States in the grocery here, which cost 17.23 sheckles (divided by 4 would be dollars). Some of Lishay’s friends are employed by company’s that cover the cost of their car, car insurance, and gas expenses. I would like to find a job like this. I also appreciate that most cars are tiny (compact compact). The State of Israel has complicated situation surrounding immigrant workers (similar to that in the U.S.). Lishay took me on a mini tour, Rabin Square (where Rabin was shot in ‘95), Bauhaus architecture; remind me to tell you about the little men that hold open the shutters. We also went dancing until 6am the other morning at a party in Yafo–Eurovision is all the rage. I went to the Negev Desert last weekend with a new friend, Mariarosa. She hails from Italy, but now lives between Mexico and NY. She is a Gyrotonic instructor. We planned our trip somewhat last-minute, fly by the seat of our pants–catch the bus to Be’ersheva before Shabbot. Everything shut down after our Friday Gaga class. Catch another bus to Mitzpe Ramon. We were going to stay at this place called Adama, but when we arrived the owners were not there, so we ended up at the only place that was open in the tiny desert village. Of course, it was a chocolate shop/coffee shop, reminiscent of the movie Chocolat. The owner, Agit, helped us call this amazing eco lodge that sat at the rim of the crater/canyon. We stayed in mud huts, had a really sweet, simple dinner, hiked around a bit, met some interesting people, had a great breakfast in the morning, relaxed, reflected. The desert was so stunning, SO quiet, the stars were amazing. I must have seen 20 shooting stars. I must have been craving that kind of atmosphere. It was hot, but not humid, at night it really cooled off and the wind would turn up. They had to have plastic windows in the lodge area b/c the winds would become so strong it would break the glass. Every time I opened my mouth I could feel my tongue drying out. We had some really nice conversations on the bus ride with other travelers and local residents. I saw the sunrise for the first time in forever. Tuesday and Wednesday Lishay, James, and I went up north to Acco. We stayed at Lishay’s parents house. They were so sweet and hospitable. We went to one the “greatest hummus places” in Israel-Hummus Said, in Old Acco. It was delicious, but sort of like a lead weight had been dropped in my stomach after eating. The place was so busy, people busting down the door, servers would clear the tables likkity split. That night we went to the Karmiel Festival. It was so beautiful, tucked in the mountains, the humidity disappeared. We saw the Kibbutz Dance Company perform, to which I had a strong reaction. Then we trekked over the outdoor amphitheater for the Opening Ceremony. Nothing could have prepared me for this. The stage seemed to be the size of a football field, bright lights, and huge screens. When we first arrived, the lawn was empty and I thought, there was no way this was going to fill up. However, it was like the first concert I went to in Tel Aviv – twister city in the grass. James and I made the mistake of trying to go to the top of the hill to the vendor stand to get some food. This story I will save for oral story telling. It was the beginning of the end of my patience with crowds. There were 5000 performers. It was amazing to see so many people at this festival for the love dance, male and female. Primarily this was a folk dance festival. Later at night they throw sand on a huge tennis court and people cut a rug to contemporary folk dances to interesting folky-pop tunes especially recorded for each specific dance. A few times a year the folk dancers meet with choreographers to learn these dances. Again, it wonderful to see people swirling through space enjoying dancing together, men and women of all ages. The next morning we went to tour the old city of Acco (James had never been). While there, we ran into Michal, a girl who performed with us in Israel 4 years ago! The following evening I went to see her perform at the Suzanne Dellal Center with the Acco Dance Center. To me, the piece felt very heavy, dark, violent, sexually violent. Generally, I find people here very friendly and inviting. I have made friends at the post office, the beach, the bus. Lately, some men have taken to addressing me as “China” in the streets. Sometimes this can make it difficult to feel anonymous. Tonight we go to see the Paris Opera Ballet perform. I have heard rave reviews. Today, the sea was momentous, wild. I could barely stand upright in the water. The other day, Lishay and his friend Oren , and I drove to Herzliya, which is about 20 minutes north of Tel Aviv on the coast. Apparently, many public officials, wealthy, ambassadors live there and the beaches claim some of the best sand and sea in Israel. I had read about a place called Hermit’s House, which is a dwelling a man constructed from found/recycled objects–tires, glass bottles, sort of mud house construction at the northern tip of the beach. It reminded me of a large hobbit house. Glistening glass and funny sculptures. Sometimes a restaurant is open there, but not on the Sabbath. The beach there was phenomenal, so beautiful, not crowded, the sun was setting by the time we left. We had to leave before sunset, because we were going to attend the rally in Rabin Square that was in memory of the individuals that had been shot the previous week at the gay teen youth center. 20,000 people attended this event. They had organized speakers, musicians, and family members to speak and sing. The president made a speech advocating for the rights of all people. It was very touching and heartfelt. Yesterday, I took the train to Haifa to see the Bahai Gardens. They were stunning. It appears they incredible maintenance of these cascading green areas that run down the terrace of the mountainside – fountains, flowers, big bushy trees. Although, I learned there is an inner and an outer garden. The inner garden closes much earlier in the day, so I had to snap shots from the base. On the train ride there a man did slight of hand card tricks and on the way back I sat across from three children who were so sweet and so curious and so full of life. I felt so energized by them and so important, they had so many questions for me. They thought I was 16. The 9-year-old boy tried to hypnotize me. Every time he said the word “apple” his sister and friend would double over in laughter. Friday, Lishay, James, and I drove to Jerusalem to visit the Museum on the Seam and Yad Veshem (the Holocaust Museum). MOTS shows works that are reflecting on, questioning, challenging social/political issues. They had an exhibit about environmental issues. The museum itself was beautiful. I appreciated seeing contemporary works making commentary on our current lifestyles. It was interesting also to come across photographs that looked like a carved out area in the mountainside or a humble housing structure, but really they are an area where a tank would hide and a building to house weapons for war in the desert. There was a great animation film by a Chinese artist named Miao Xiaochun, entitled Microcosmos–it was my favorite piece in the museum. I am not sure what type of animation it was, but it was like watching a dance, so fluid and clear and I found myself having so many memories and associations with the images while still aesthetically enjoying the film. What I can say about the Holocaust Museum is thank goodness as you make your way through the museum you are working your way towards a beautiful view on a landing that overlooks part of Jerusalem and gorgeous landscape with pines, flowers, and trees. The design of the structure is also beautiful. Lishay said this is the new location for the museum, about 2 years old. From the minute I walked in I had goose bumps. It is a concrete structure, vaulted like an a-frame, windows at the top. It begins with walls of photographs of individuals who were murdered (portraits) and a story about a particular situation where after the people were killed their personal items from their pockets were taken. The glass cases beneath the photographs displayed the items found from their pockets, trinkets and important things they had taken with them when they were forced to leave their homes. I really had a new sense of the unfathomable numbers of people and areas that this affected. It was so disarming, unbelievable, unreal. Yet, the way that everything was displayed also allowed me to gain a sense of really honoring the individuals lost and surviving and remembering this event. It made me think of Toni Morrison’s Beloved and her themes of Re-memory. There were some videos with interviews of survivors. This is the point where I completely lost composure–the stories themselves are horrific, but the sheer numbers add to the horror. The entire time we were being ushered through the museum because they were closing early for Shabbat. I could feel myself getting heavier and heavier the further along I went, looking around people were crying. The final room in this building is called the Hall of Names. A room with a theme much like the Vietnam Memorial in D.C., a cylinder shaped room with a funnel on the ceiling with photographs of people in remembrance. The walls are lined with binders containing names of people who did not survive, it was heart stopping the amount of notebooks, and the shelves still had empty spaces for them to be added. Afterward, we went to the old city of Jerusalem and walked around. Shops and shops and more shops and people beckoning you in. We went to a restaurant that did not have menus and when the server told us what we could order, for some reason we did not ask the price–it was pretty standard fare that was typically cheap. I guess you have to watch out for this. Our bill ended up totaling 239 shekels-ouch. We left soon after that because the city was closing for Shabbat and certain roads are closed. I did not recall Jerusalem being so breathtaking, beautiful, well kept, the white and creme colored stone on the buildings, the desert mountain landscape. On the way back, on our way to Abu Gosh, a village where Arabs and Christians live together, the mosque and church are side by side. We had to drive through Jerusalem. There was a period of time where the 3 of them spoke in Hebrew. Later, they told me that we had accidentally turned down a street that is closed for Shabbat. Apparently, we were lucky that the car was not stoned. Lishay said he saw stones lying in the street. They did not want to alarm me. Once we arrive in Abu Gosh, we went inside the church then had some delicious and decadent Baklawa (not Baklava), full of honey and nuts. After falafel and hummus, of course.